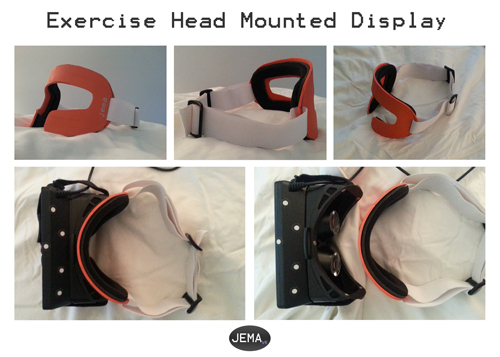 Since I first presented it a few weeks ago, the exercise HMD concept has adapted and grown up a bit. The mask portion is made from Kydex, a far more versatile material. There is still a removable foam liner. With regard to lens fogging, I’ve used a tiny bit of anti fog coating that I had lying around for my diving mask and it pretty much alleviates any fogging issues. Hey this is great, How quickly can you swap these out? They swap out in a matter of a few seconds. It’s a matter of pulling off the liner and placing a new one onto the guide posts. Is it a velcro attachment and is it machine washable? If velcro, how do you prevent the OR from flying off with fast head movement? There are 2 connections: The first is the connection between the face mask and the HMD. That connection is made by magnets on the surface of the mask and corresponding magnets on the HMD. 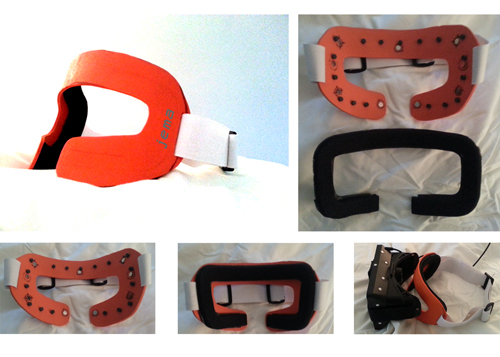 The magnets I used are strong enough so that the HMD will not disengage even with rapid or jerky head movements. The magnets do not interfere with head tracking. Other means of connecting the mask and the HMD are possible but magnets keep the alignment spot on…plus they are cool. The second connection is between the foam liner and the mask. That connection is made by a post-hole connector where posts on the inside of the mask fit into holes on the foam liner to hold it in place. Of course other means of connecting the liner are possible and I’m experimenting to find the best one. The liner in the current prototype is not designed to be machine washable but future iterations will be.